The warehouse is in many ways the heart of any industrial operation. As the source of equipment, raw materials, and the core of both dispatch and inward handling of goods, any process failures within the warehouse can have very significant long term effects on your whole business. Having a smoothly operating orders system in your business will have a very positive effect on operations, and pay off in the long run in the form of greater productivity and profits. The cornerstone of efficiency is providing the most appropriate warehouse equipment for your staff in order to make sure that whatever duties they have to carry out can be done easily and without error. Errors causing accidents, injury and damage to product are the greatest cause of unnecessary cost in the workplace, and in general, these errors can largely be avoided through the use of the proper warehouse equipment. Most errors seem to occur when staff use incorrect equipment to carry out a task, and because the warehouse equipment that they are using is ill suited to the job, rather than being a specialist piece of kit, they must compromise on their work, and potentially cause damage. The central piece of warehouse equipment is the forklift truck. These versatile machines are custom designed for moving equipment and materials around efficiently, they are also the basis for many other pieces of warehouse equipment such as special fork mounted hoppers and even custom fork covers that have been designed to make carrying unusual and unwieldy objects easier.. Using the forklift as the core of your warehouse equipment will give you the chance to make lifting and carrying equipment from one place to another easier and quicker, although as with all business decisions there is a compromise that has to be made. 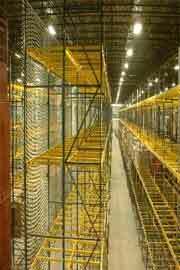 It will be necessary to put wide aisles between any shelving to provide access for the forklift, and this means a larger warehouse is required. Higher shelving units allow for more intensive use of space, but in turn require a forklift with a higher reach, and this has implications for cost and training. The various types of trucks, carts, and pallet jacks that are available make up a large portion of the warehouse equipment that most businesses require, and choosing appropriately can have a big impact on the efficiency that you record. There are special carts to carry particular items, and attention should be paid towards purchasing carts that match with the materials being carried as well as the kind of flooring and condition of the warehouse itself. This will ensure that the best match is achieved, and will provide you with reliability and good value going forward. The field of warehouse equipment encompasses a wide range of different items, and while not all of them require specific training for staff, time spent on improving the understanding and safety that can be observed by employees will pay off in the long term thanks to better efficiency, fewer accidents, and a more productive warehouse supplying all areas of your business.